The Importance of a single paddock tree is often underestimated. A paddock tree can reduce the evaporation of soil moisture and protects pastures: if you have a 20m tall tree in your paddock that tree can divert wind off the paddock for a distance up to 15 times the height of the tree. • add nutrients to the soil through microorganisms breaking down leaves, branches and seeds. All these actions to look after your paddock trees and boost farm biodiversity have multiple benefits including increasing stock fertility, weight gain, wool/milk production, soil health and property value. To be held on 16th March at 555 West Road Pyalong, 10am start, finishing at 12pm with a BBQ. Please RSVP by 12th March for catering purposes. This entry was posted in Uncategorised on March 3, 2019 by Sara Kite. Did you know we have confirmed sightings of platypus in areas surrounding the Goulburn River Walking Trail and Kilmore Creek? There is very little known about this iconic Australian native, and we know even less about how well they are doing. An exciting Citizen-Science program is being developed to monitor platypus in rivers in the Goulburn Broken Catchment, and the Australian Platypus Conservancy (Official) are looking for volunteers to help out! Experts from the Australian Platypus Conservancy will be presenting a free talk about how YOU can get involved. The sessions are free but registration is essential. Please RSVP to Andrea Muskee on 5822 7707 or andream@gbcma.vic.gov.au by 5pm Tuesday February 26. This entry was posted in Uncategorised on February 16, 2019 by Sara Kite. “The Victorian Government in partnership with Traditional Owners is embarking on a major program to reform our forest management and guide the modernisation of the Victorian Regional Forest Agreements.” This gives us another opportunity to add our voice in calling for changes in forest management. Go to https://engage.vic.gov.au/future-of-our-forests and tell the government about the places you value and how they should be used and managed. Forests have been a point of contention for decades, and the Regional Forest Agreements were an attempt by governments to balance the many conflicting views on how forests should be used. Following a decade of extensive resource assessments and consultation, 20 year Regional Forest Agreements in various regions were signed off between 1997 and 2000 (see here). They were supposed to be plans for “the sustainable management and conservation of Australia’s native forests”. Although they did slow the debate, there has been a lot of concern about how forests have actually been managed over the past 20 years. Conservation groups supported by Environmental Justice Australia have successfully mounted several legal challenges over the management of forests across Victoria (see here). Also. our views about these forests have changed. More people value forests for reasons other than for their timber and woodchips. Declines in biodiversity in general and iconic forest species such as the Greater Glider and Leadbeater’s Possum have stimulated pushes to protect many of our forests. With climate change, forests in the higher and wetter areas of Victoria are becoming more and more important as refuges and core areas for biodiversity, and as the catchments for all our river systems. And more and more people are appreciating forests for recreation and an escape from the rush and turmoil of life in our towns and cities. So there are many calls for more protection for our forests from destructive exploitation – see https://vnpa.org.au/future-parks/. Locally we are looking at ways to protect the forests extending from the northern Strathbogies (see https://strathbogiesustainableforests.wordpress.com/) through to the Tallarook Ranges and Mount Disappointment Forests (check out https://www.facebook.com/mountdisappointmentclonbinane/). So please add your voice to all the calls for better conservation of our forests. Video: Strath Creek Falls in the Mount Disappointment State Forest (with thanks to Friends of Disappointment). This entry was posted in Uncategorised on January 25, 2019 by Sara Kite. A new year and a fabulous new line up of products has made it to our bulk foods list to tantalise your tastebuds and nourish your families. Head to the BBFS page for the February 2019 order form. ORDERS DUE: Wednesday 6 February midnight. PAY 50% DEPOSIT: Before 10 February. DIVIDING UP DAY: Wednesday 27 February at Blue Tongue Berries. Individuals between 9am to 10:30am and pods after 10:45am. The list has been extended to include many more every day items and where possible, if the cost difference is not great we have taken the organic or biodynamic option rather than the conventional. We are still battling to source some items such as local vinegars and cashews seem to originate from Vietnam now and bicarb seems to be from China. 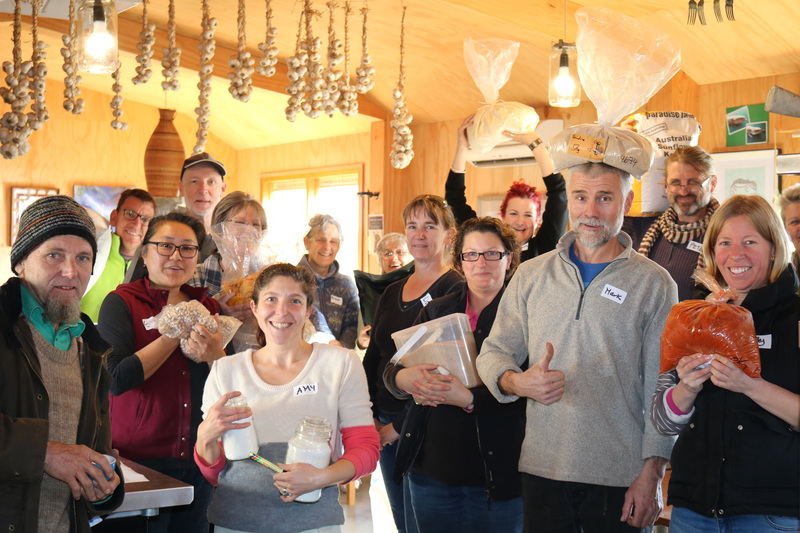 Happily Pepo Farms (Australian Pumpkin Seed Company) are steadily increasing their range and you will see more items from this family owned company supporting community growers. You can read more about them here. We have also extended our range sourced from Biodynamic Marketing. We have changed the price column to show the per kL/L/unit price rather than the full bulk price to make it a little easier to see what you are paying straight up. We will adjust the way our dividing up day works to try to alleviate some bottle necks and have individuals arrive, pack and mark off their items between 9am and 10:30am and pods start after 10:45am. Of course we are flexible and understand not everyone can work within those times but it should help reduce the jolly mayhem! We are still working on the cleaning and bathroom products and will hopefully have more on offer in that area by the next order. Feedback and new participants are always most welcome. Keep spreading the word as with every new participant it’s a few less pieces of plastic and hopefully more time and less stressed people in our community! This entry was posted in Uncategorised on January 24, 2019 by Sara Kite. Emily Walker from Infigen Energy emailed to let us know that “the Cherry Tree Wind Farm achieved financial close last week so will start construction in January! It’s been a very busy last few months trying to tie up the last of the land agreements, permits and contracts, but we finally got there!” See more information on the attached ASX release. At last! The original planning application was submitted to the Council in April 2012 and received 110 objections and 5 submissions of support. BEAM mounted a big campaign to assure local residents that the fear campaign mounted by outside groups were not based on facts – that wind farms did not pose any threats to local residents and that wind farms provided benefits for both the local economy and our urgent need to reduce carbon emissions. The issue went to VCAT. In a decision on 26 November 2013, VCAT over-ruled all the major objections to wind farms in general and the Cherry Tree Wind Farm in particular. Since then, the impact of Commonwealth Government policies on the electricity market has delayed this final step fort Infigen. They have finally overcome even these hurdles. We look forward to seeing construction beginning very soon. This entry was posted in Uncategorised on January 13, 2019 by Sara Kite.